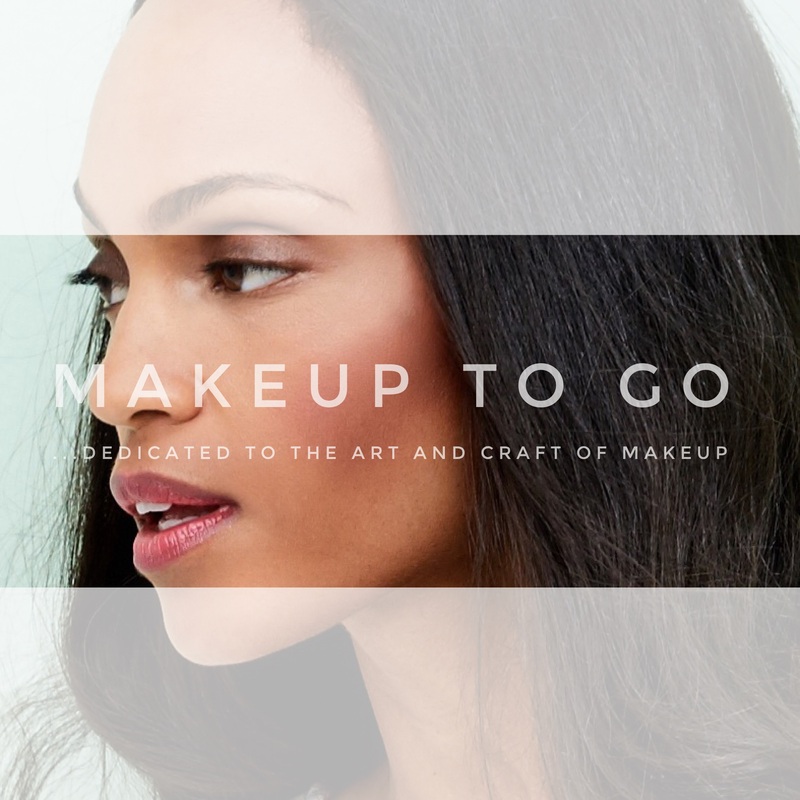 Category: So You Wanna Be A Pro Artist(tm) | Makeup to Go! The “So You Wanna Be A Pro Artist” (SYWBAPA) article series was started when I first started the Makeup to Go! blog and had no readership whatsoever. It is hard to believe it has already been 2 years since I started the series! The “So You Wanna Be A Pro Artist” series was written both in response to the numerous inquiries I had received about embarking on a professional career and because I was leading up to a LFAA™ Workshop and I wanted to establish some groundwork. As “So You Wanna Be A Pro Artist” is an informative and well-written series – if I do say so myself 😉 – so I am revisiting it for those who may not have seen it when it first ran. Also I want to bring some of the information and Resources up-to-date as a lot can change in two years. Pretty self-explanatory, this is just an overview of what I had in mind with the series. These three articles – Getting Started, Now Why, and How are overviews designed to get readers to think about their approach to their careers. Students often kind of buck me on this or they just ignore it but then invariably a year later of freelancing under their belts they come back and tell me I was right. I know I was right LOL! I know because the people who told this to me were right. When I find myself at a career plateau I often go back and re-visit these steps in order to make a plan of what I should do next. I am not as anti-school as I used to be (I mean, I do teach at a makeup school, after-all) but I am still adamant that you cannot trust your career to the first school with a fly website (some schools do not even have that). IF you decide that makeup school is the best way for you to learn this craft, you must must must vet a makeup school thoroughly. Many makeup artists never go to makeup school, including some of the best to have ever worked in the profession. It is entirely possible to be a self-made makeup artist and eventually work at the top of the field. In the original article I listed Art of Makeup by Kevyn Aucoin. That is my favorite and in my opinion the most instructional of his books, however it is long out of print and if you do find it, it is expensive. Making Faces was Kevyn Aucoin’s second book and I would also probably say his most popular book. It, too, features many great break-downs, photographs and instruction. Of all of her books this is by far her best, in my opinion. It is well photographed, has clear explanations, and covers a gamut of looks on a wide array of faces and complexions. This is a visually stunning book using a really innovative overlay technique to demonstrate how to achieve the looks. François Nars is a true master so there is a lot to be learned in this book. This book may be a bit advanced for the average consumer but it is perfect for aspiring Artists. A newly updated version of my Preferred Products list is available on the FREEBIES page (click to go there). My own actual working kits have actually changed quite a bit since this post was first created, so I will likely do a new story on that altogether. …as done by House of Portfolios. They actually got the spelling of my last name incorrect as you can see (it’s Russell with two “L”s), but they immediately shipped me a corrected book at no extra charge. The final two installments of the original series focused on the nuts and bolts of building a book and promoting yourself for work. Needless to say these two topics are intertwined: you gotta meet people to develop a portfolio and then you gotta go show your portfolio in order to meet people to get hired for work. Even on the free end, these are very good looking and easy to navigate Flash websites with a mobile “back” to work on iPhones, iPads, etc. At this point you’ve studied – either via school or DIY, you’ve built your kit, and you have the beginnings of a portfolio. You have now reached the point of the big NOW WHAT? In life, somethings are purchases and some are investments. The Hair Makeup and Fashion Styling Career Guide is an investment. 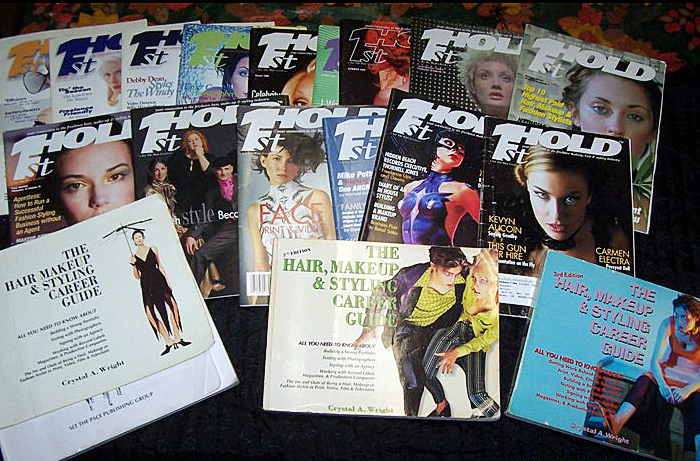 Pictured at the top of this article is my collection of Ms. Wright’s publications (including the sadly no longer in print, 1st Hold magazine, which was the one and only true trade magazine of the print side of the hair/makeup/wardrobe industry). I still have all of her publications to this day and while some of the information has changed over time the principals have not. Crystal Wright is the former owner of the Crystal Agency (agency is closed, the site is just up as a shell to show the students of her marketing classes). As a former agent she built the career of many a new artist taking many of them to Star Artist category. I was never represented by her agency, but she has been a mentor to me over many years and her advice has rarely failed me. Didn’t I mention this book in my previous So You Wanna Be A Pro Artist installment? Why Yes. Yes I did! It’s that crucial so pony up for $50 and go get this book, folks. While I’m at it: If you can afford to do so, I’d also suggest taking one of Crystal’s “Packaging Your Portfolio” workshop. For the DIY-ers in the house, this is an interactive workshop – with Crystal Wright herself – that goes further in depth with the principals of the book. I took her very first class back in the day and you can see how that worked out for me 🙂 . If you went to school you might be thinking “why do I need to pay for another course” to which I’d respond thus: You just spent $10K plus to become a makeup artist. Don’t you want to actually work as a makeup artist now? I thought so. Take the class. I touched upon this a bit in the Portfolios installment of this series, but now I’m going to break it all the way down. There are four key items that are essential to your marketing “kit”. These are; your Website, your Business Cards and your Promo Cards, and your Portfolio. This is the most important of your marketing tools. Your website needs to be clean, efficient, easy to navigate and aesthetically pleasing. Websites with too many whistles and bells and dancing screens and loud music and this and that are a TURN OFF and that is literally what visitors will do. Back in the day your only option was to get a custom built site, which can be costly. Now days you can either get your site custom or you can take advantage of the many template sites that exist. These sites allow you to customize the look of the site, but the template provides the programming (the hard part) and you can get a clean, professional website up in a day. The price for these sites range from free (although the free ones have serious limitations) to expensive (my site first template website cost $79/mo !!) and all points in between so there is no reason why you cannot have a professional site within your budget. Important Note: While Flash websites have been the norm for a while now and they do offer significant advantages, it is important to get a non-flash ‘back” to your website that can be read on mobile devices. This is a reality in today’s market and you don not want to lose a job because the photographer could not see your site on his iPhone. All of the templates I recommend at the end of this section – with the exception of the Wix site – offer built-in mobile versions of the site. I would wait a bit before getting a photo business card, reason being is you cannot take back a first impression. You want a photograph to clearly tell someone the type and caliber of work they can expect from you. I suggest not adding a photo to your business cards until you have a GREAT photo to add. 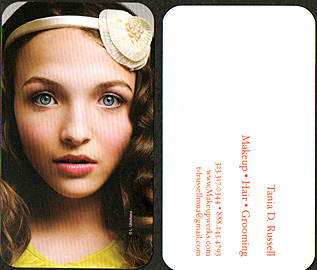 While the progression is clear, what makes my first good card my first good card is that it is clean, professionally offset printed (laser zed cards are not good enough quality for an artists promotional peice), with one really good photograph that really showcased my style of makeup well (this is a postcard promo, so the back just has my return address/contact information as well as the photographer’s credit). I got a lot of mileage from that first card in terms of meeting more photographers and building my book further as well as my first little paid gigs. The second card was actually the card that landed me with my first agency. So again, when making your promo card it is all about a clean, straight-forward design and great images that showcase your best work to date. In the resources section at the end of this article, I list a few places to get your promos printed. I have already discussed building a portfolio and putting one together at length. Check out my previous articles on Portfolio Building and The Actual Portfolio. While much is done via the web, as I discuss in those articles it behooves you to also maintain a physical portfolio book. Once you have done these steps, there is nothing left to it but to do it. Let your friends and family know you’re in business (word of mouth is still one of the best marketing tools), and start sending those emails and making those phone calls. The more you do it, the more you’ll become used to doing it and the easier it becomes to do. If this is truly your dream job, you and you alone have the power to make it become a reality. Get started. – Web Photo Master No longer owned by who I thought owned it and I’ve heard of users having LOTS of EXTREME problems with their websites using this service. **Why is my URL name Makeupwerks? Well at the time I wanted something that sounded like an agency. Fortunately I picked something that sounded professional and actually I do get inquires from people who think it is an agency, but in retrospect if I had it to do over again I would have just gone with my name. 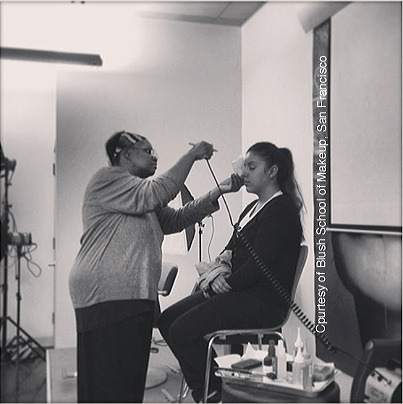 Continuing on in the mission of becoming a professional makeup artist, in this the 8th installment I was going to go into the basics of marketing yourself as a media makeup artist (which was going to be my last installment). However, a lot of you wanted me to go back and pick up on what I wrote about Testing. That’s it. That’s all a test is. In theory. The difficulty testing is the practical reality of what makes a GOOD test. Seasoned artists already know most of what I’m going to say so I’m going to assume that most of the fine people reading this are newer artists to the game. Here then are my suggestions for putting together portfolio worthy test shoots. Also known as a “Morgue” (I have NO idea why), a Lookbook is a collection of tears of inspiration photographs. This is an internal process for you to begin studying and dissecting styles of makeup, styles of photography, how hair and wardrobe fits in, what artists are doing what work, etc. I believe this is a really really crucial tool. You cannot even pretend to want to be a part of this industry if you do not know anything about it. Building a Lookbook will arm you with knowledge and inspire your own creativity and help guide you in my next testing suggestion. I can always tell when artists don’t Lookbook. I think the A-#1 thing I see wrong about a lot of tests I see of young artists is that they do not in any way resemble any work that you would ever see anywhere. Remember: The point of your portfolio is to show what you can do so that decision-makers can hire you. If they look at your work and cannot envision your work fitting in with what they are planning to do, they won’t hire you simple as that. This applies to anything from a headshot shoot to catalog to high-end editorial, clean or edgy. 3 ) Begin with the end in mind. This comes from the landmark book “Seven Habits of Highly Successful People”, written by Steven Covey. The idea is that in order to reach a goal, you have to know what your goal is. A lot of folks feel somehow that “winging it” makes them more of an artist. While creativity and spontaneity are important for an artist, very few jobs are just thrown together. Things may change as you begin working but you really should have a gameplan on what you’re going to do before you get started. Remember – a test is a coming together of a group of people to achieve a singular goal. Everyone cannot be fixated on his or her own individual fabulousness. Everyone’s vision Has To come together as one. It is worth the time to plan things out and make sure everyone is on the same page before the shoot begins. This goes hand in hand with good planning; in order for you to have a successful shoot which yields multiple images to add to your book, you need to stay focused. If you are shooting – say – a hippy themed editorial and the shoot starts out outdoors with flow-y hair and makeup and bohemian clothing, it cannot end up inside in a studio shoot with slicked-back hair and smokey eyes a la Tom Ford Gucci. At that point it is no longer the same shoot and they won’t look good together. At all. You can’t shoot an entire portfolio in one day so do not try. Take your time and execute well thought-out and focused shoots. 5 ) You Will Be Better Served With Clean, Pretty Images. This goes for makeup and hair and there are a few reasons for this. First of all, there is FAR more work doing clean makeup than there is edgy. Secondly, clean makeup actually takes a lot of skill and decision makers want to see beyond whistles and bells and really know you can do professional-level makeup. Thirdly, and this is real, edgy is either right or it is Totally And Completely Wrong. The line between a really striking, innovative image and some tacky amateurish looking schlock is a fine one. Better to have beautiful, simple images rather than sloppy “edgy” ones. 6 ) Don’t Pay to Play. A lot of young artists, desperate to get good images, are tempted to pay a photographer to test with them. I cannot emphasize enough what a bad idea I think this is. A photographer that will only shoot with you if you pay them does not want to work with you. Therefore, not only is any hope at a true collaboration out the window, but so is the possibility of developing a longer-term relationship with someone who may someday hire you. Really, it is Mission Difficult to get a test together, but not Mission Impossible. Take the time to contact and meet photographers who will want to collaborate with you. 7 ) Forget This “Testing Fee” Madness. Likewise, this neo-trend on various online “networking” sources of artists charging Testing Fees is ridiculous. Do you want great images to develop your portfolio or not? Your “payment” on a test shoot are the beautiful images you are going to obtain. Images which, if you work on a good shoot with a good team, will translate into your being able to market yourself for full rate jobs. And I am going to be real right now; None of these “testing fee” artists I see online ever have portfolios strong enough to get real jobs. Presumably that is why they have to waste time with this Testing Fee silliness. Don’t fall for the madness. Develop a solid portfolio and the money will follow. Now I will add this addendum; There is such a thing as a Paid Test – but that’s different than what we are discussing now and I’ll get to that later. For right now, focusing on developing a working portfolio should be your priority. I actually coined this now internet-popular phrase (although a lot of other people have been given/have taken credit for it :-|), What I mean by this is that EVERY time you test you should be striving to improve upon what you already have. Improvement can take a lot of forms and what constitutes and improvement will obviously change throughout your career, however, EVERY time you test should be an improvement. And remember; great makeup in an otherwise mediocre shot is just a mediocre shot. The entire photograph has to work from top to bottom for it to truly be Portfolio Caliber. 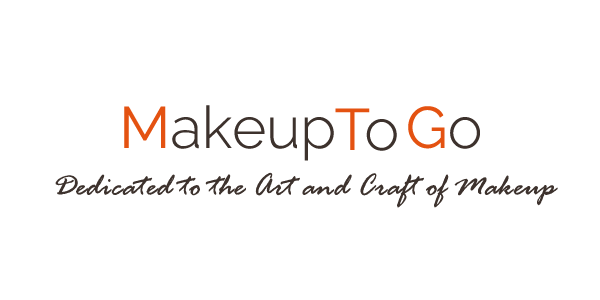 This is obviously specific for makeup artists, but I’m a makeup artist and makeup is what this blog is all about. The main thing about a book is that it should show a range of styles of both photography and makeup. HOWEVER when you’re first starting out, the most important thing you can show is your potential. You can’t dazzle anyone with your amazing tears yet, but you can impress someone with your creativity and talent. Therefore you need photographs that really showcase your makeup. Fashion shoots are fun and edgy and amazing, etc., but the focus of a fashion shoot is the clothes so they may not show what you need to show of your work. Also, fashion shoots are much more difficult to put together as you absolutely need a good stylist with access to great clothes to make it work. A beauty shoot just needs a good photographer, a strong model and you. New models and new photographers all need photos for their books just like you do. You will be much better served working through agencies for your models and photography/art schools for young photographers. The internet is the wild west; people are not necessarily who they say they are nor are their intentions necessarily what they say they are. There is a lot of game-playing online. You want to align yourself with people who are serious and on the same page as you as soon as you can. You may meet people via online sources, but relationships are forged in real life. Note: People are crazy. Be careful when you set up meetings via the internet. I always try to steer such meetings to public places rather than people’s homes, and I let friends/family know where I’m going, etc. • This is a very very early test and it looks like it. Nothing is “wrong” with it, per se, but there is nothing great about it either. I was lucky that I worked with good photographers pretty much off the bat so the photograph is technically good (crisp, well lit, etc.). This particular photographer did have an affinity for shooting in front of the same red brick wall for EVERY shot so I suppose this is one of the lucky exceptions to that rule. LOL. Makeup-wise, the makeup is OK but the brows need work. In my early tests I didn’t pay enough attention to the hair. This particular shot of the model was not flattering (although others in this same shoot were better). It’s just an “eh” image overall. 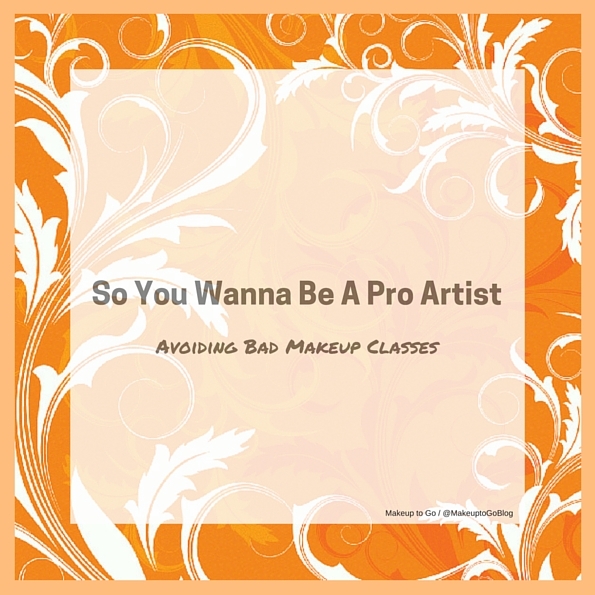 Both of the following really cover the A – Z of becoming a professional, working makeup artist and include strong chapters on testing and building a portfolio. Please go buy the Hair, Makeup and Wardrobe Career Guide written by Crystal A. Wright. There have been complaints in the past about slowness in sending out the books. She’s a micro-publisher and sometimes the timeline depends on her production schedule. If you have to wait, Wait. It WILL be worth it (and apparently her shipping problems ended in 2010 and she now has plenty of books in stock). Crystal has been a personal mentor to me and to a lot of us out here, and back when she published the first edition of The Guide there was almost NO information on how to go about becoming a makeup/hair/wardrobe artist on the print/agency side of the business. Almost all the info there was pertained more to the film/tv/union aspect, which is completely different. As a former agency owner (the Crystal Agency) her book gives great insight on becoming a Working Makeup Artist, Hair Stylist or Wardrobe Stylist from the viewpoint of a person whose job it was to get folks like us hired. • Shortcuts to a Successful Career As a Hairstylist or Make up Artist in the Fashion and Entertainment On the other side of the coin, Shortcuts is written by successful men’s groomer Diana Schmidtke. Her book is from the view point of a successful working artist and is filled with anecdotes of what it took to get where she is now. I have not personally read this book (I need to order it) but all the reviews I’ve read have been highly positive. The only real plus to the off the shelf books are the price. They are significantly less expensive than their custom counterparts, hence they are where many new artists start. IF you are going to go the off the shelf route, I would suggest getting a ring bound book as pictured below. The reason being that it is extremely important to keep your portfolio pages clean and when they get scuffed up, to replace them. You can’t do that on the permanently inset books. Also not every type of client needs to see every photo you’ve done. It’s important to tailor your presentation to who you are showing it to. Again, you can’t remove pages from the inset books so it’s more difficult to change the order of photos or to take photos out. Lastly, you never want to show someone a book filled with blank pages, which when you’re starting out you obviously aren’t going to have a lot of portfolio caliber photos. 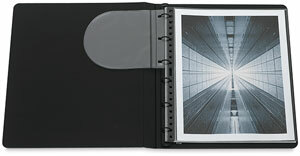 With the ring-bound books you can take out the empty pages, but with the inset books you cannot. Here again is my book. This is a custom, faux-leather, 9×12 book that I ordered from JC Presentations (the book itself is actually 9.5 x 12.5 so as to accomodate 9×12 size prints. 9×12 is a standard Professional sized print). As you can see, there is a price difference. However ordering custom allows you – for a price – to tailor the book to your needs. 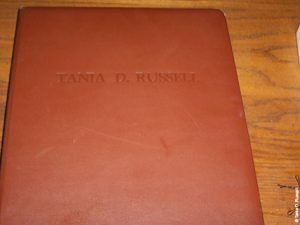 Custom books are Post Bound meaning that the pages are set on posts in the binding. Therefore you can take out, change, remove pages as needed or desired, but when the book is closed it lays flat like an inset bound book. It looks much better as it doesn’t have visible binding like a wire-bound book. You can dictate size, the number of pages, the type of pages, what type of material your book will be (leather, faux leather, fabric, etc. ), the color of your book etc. The representative can help you sort through all these options when you place your order. Whether you decide to get a Custom book now or later, eventually you will get a custom book. Customs are the Industry Standard and they are what agents expect their artists to have and what working professionals (photographers, art directors and others who may hire you) will expect to see. There are 3 basic businesses from which most artist order their books. As I mentioned, I get my books from JC Presenations. I’ve been ordering from them since they were in operation under a different name and I can personally attest to the quality of their product and the excellence of their service. Also their prices are very good as custom books go. The other two main portfolio businesses are House of Portfolios and Brewer-Cantelmo. As you’ll note, they are all comperable in terms of product. House of Portfolio and JC Presentations are comperable in price, with Brewer-Cantelmo being a bit higher. I’ve hear various things about dealing with each company, and I’ve also heard that Brewer-Cantelmo’s books are amazing. I do not personally know, that is something you’ll have to research for yourself. Of the three I would say that House of Portfolios is probably the best known. What size book do I get? The standard sizes for makeup artists are 9×12 or 11×14, with 11×14 becoming the most popular. 8×10 books are completely passé, do not get an 8×10. Do I Still Really Need A Book? I say yes. Even though much of what happens these days happens digitally, I find that when I go to meet people the do expect for me to bring a book for them to look at. Printed photographs have much more detail than digital images on a screen. People like to really look closely at your work and study the details so right now I still say an artist should maintain a physical portfolio book in addition to their online presentation. Many predict that the newly released Apple iPad will become popular as presentation tools for in-person meetings, but that will remain to be seen. Even so, however, if the client asks you to leave your book behind for a few days so they can show it to other people in the company (which is common) would you really want to leave your expensive iPad? I would not. What Color Book Should I Get? You can get whatever color book you want when you order a custom book. The issue is the content. I agree with Crystal Wright (former agency owner and author of the ‘Hair, Makeup and Wardrobe Career Guide’ that newer artists would be best served to stick to Black or Brown. If you are going to have some wildly colored book that stands out, you’d better be sure that the work inside stands out as well. Save the Hot Pink book for when you have Vogue and Harper’s Bazaar covers inside. This really varies depending on who you ask. Some folks say you should have at least 10 great images to start approaching people for work and add 10 more tears (published work) when you start approaching agencies. Some say your should have less than 30 images, some say less than 40. 40 is a lot of pictures and those pictures better really be killing it if you are going to have that many in your book because otherwise folks will just be flipping through without really reading. 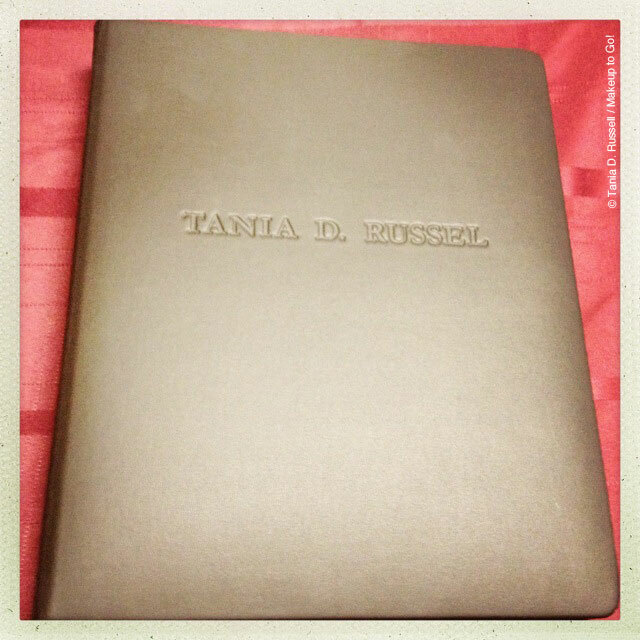 One absolute rule of thumb that everyone agrees on: A portfolio book should be All Killer No Filler. Decision makers will ABSOLUTELY judge you on your WEAKEST image. That’s the one they are scared you are going to do if they hire you for a job. If you cannot stand 100% behind an image and say you love it, leave it out. More is NOT better when putting together your portfolio. What’s The Difference Between Waxskin vs. Leather books or Acetate vs. Polyester Pages? That’s all the technical stuff that you need to know before you order your book. House of Portfolios has an excellent FAQ that answers all of these questions. Scroll past the part about their ordering policies, etc. and you’ll see answers to questions about supplying materials, getting your name imprinted as well as the differences between the kinds of pages, etc. These types of questions are basics of how Custom books are made and the answers will apply regardless of where you decide to order your book.